The Adhesion Gel was a gel type scrapped from the final release of Portal 2 and can only be found in the Portal 2 Authoring Tools. The gel was supposed to "paint" the floor, walls or ceiling and the player could walk on the walls and ceiling of the Test Chambers to resolve the tests. The only remaining effect of Adhesion Gel is that objects coated in it (although they lack a coated texture) will not slide along Repulsion Gel on the floor and Vice Versa. According to the Portal 2 developer commentaries, play testers were too disoriented when they had to think with portals while walking on walls and ceilings. Valve had ultimately scrapped the gel as a result. The Adhesion Gel was eventually replaced with Reflection Gel after an update to the game, which uses the same textures as the Conversion Gel. The updated gel is not found in the game, but it is usable to redirect lasers with. 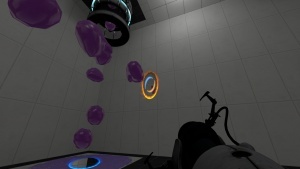 The Adhesion Gel was initially meant to function the same manner as the blue stick paint in Tag: The Power of Paint, the game off of which Portal 2's gel mechanics are based on. Stick Paint from Tag: The Power of Paint, the game that was the basis for the Portal 2 gels. A cube covered by the Adhesion Gel, in a modded Portal 2. This page was last modified on 1 May 2018, at 23:57.